In most preseason basketball polls, LSU was considered the No. 5 team in the Southeastern Conference. During the Tigers’ 7-1 conference start, they have not played any of the four teams picked to finish ahead of them – Tennessee, Kentucky, Auburn and Mississippi State. That situation will change over the next eight days when three of those teams are LSU opponents. This rugged three-game stretch will start Wednesday when the Tigers play Mississippi State at Humphrey Coliseum in Starkville (8 p.m. Central/ESPN2). Following the game against the Bulldogs, LSU will return to the PMAC for a matchup with Auburn on Saturday afternoon. Next Tuesday night, the Tigers will take on Kentucky in Lexington. Of these three teams, only the Wildcats have lived up to expectations. Kentucky has won seven SEC games in a row after losing at Alabama. The Wildcats are tied with LSU – one game behind Tennessee. Both Mississippi State and Auburn are in a six-way tie for fifth place with 4-4 league records. “The schedule is certainly going to become more difficult as we move forward into February,” Tigers coach Will Wade said. “We have overwhelmed some of our opponents in the first half (of the SEC schedule) with our talent. Wade felt some of those details have been lacking in recent games. LSU needed a miraculous rally to force overtime and beat Missouri. The Tigers only performed well in the second half when they won at Texas A&M. 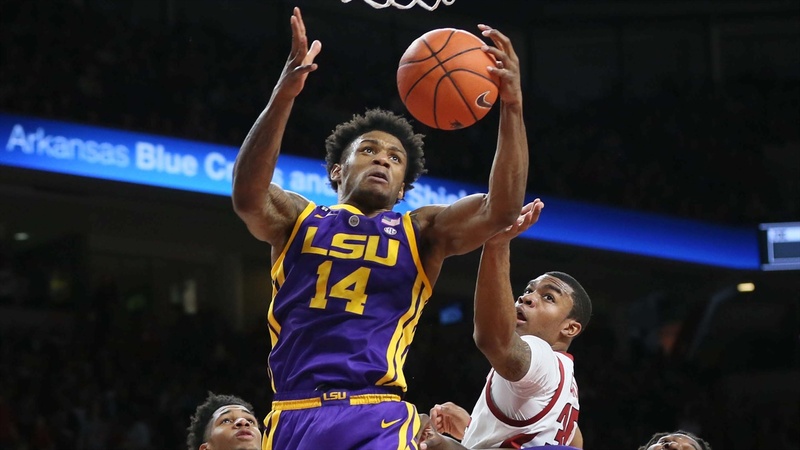 LSU overcame an 18-point deficit against Arkansas only to lose by one point. “Arkansas played harder than us,” Wade said. “We played hard, but we had too many lapses. Arkansas was a little hungrier than we were and that shouldn’t happen, especially at home. There were ten 50-50 balls in the first half and we got just two of them. Without a doubt, point guard Tremont Waters made a poor decision when he attempted a lob pass to Marlon Taylor at the rim with 45 seconds remaining and LSU leading the Razorbacks by one point. The ball went out of bounds to Arkansas, who scored the winning points on the ensuing possession. “We needed to get a better shot than we got there,” Wade said. “We are not going to go 2-for-1 if we are up by one point. We would do that if we were down by one point. I wrestled with calling a timeout. But, I was worried about us getting the ball inbounds on the side against Arkansas. The Razorbacks had a much better evening from behind the 3-point line than LSU. The Hogs, a poor deep-shooting team, made 54 percent of their 3-point shots (13-of-24). Meanwhile, the Tigers connected on only 21 percent of their 3-pointers (5-of-24). “We didn’t give up as many 3s to Arkansas the first time (3-of-16),” Wade said. “We did some things which opened things up for 3s this time and that’s on me. We left a couple of kids open because their numbers said to leave them open by design. Mississippi State is No. 3 in the SEC in 3-point shooting at 37 percent. Three Bulldogs starters are connecting on at least 39 percent of their 3-point shots – wing Nick Weatherspoon at 44 percent, post player Aric Holman at 42 percent and point guard Lamar Peters at 39 percent. Mississippi State’s top player is wing Quinndary Weatherspoon, who is averaging 18 points and six rebounds per game. Peters, who played at New Orleans (La.) Landry-Walker High School, is averaging 13 points and six assists per game. Holman is contributing 11 points and seven boards a game. The Bulldogs have been very good at home as they have won 10 of 11 games with the one setback coming at the hands of Ole Miss. Mississippi State has homecourt league victories against Florida and Auburn. Four of the Bulldogs’ five losses on the season have been by four or five points. “Mississippi State is as talented a team as there is in the league one through ten,” Wade said. “They shoot the 3 particularly well. They are great on the offensive glass if they are not making their 3-pointers.